Are you looking for a delicious cheese recipe with a difference? If you are, you’ve found it! Here’s my paccheri with four cheeses for you to enjoy. Originating from Campania and Calabria, paccheri is a popular pasta shape in the region of Marche. When filming there I made this dish using a selection of delicious cheeses. This is a tasty and filling meal that’s really easy to make – it’s my version of a posh macaroni cheese! 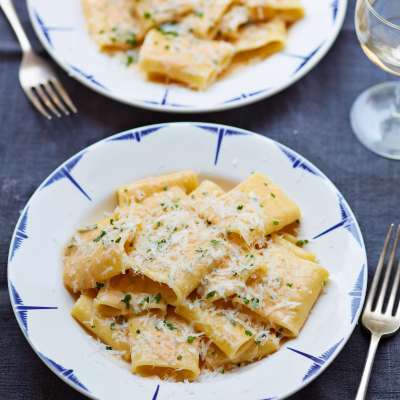 If you can’t find paccheri you can use large rigatoni for this recipe. If scamorza is unavailable, use a mixture of ordinary mozzarella and smoked Cheddar. Feast your eyes on the finest paccheri with four cheeses! It’s straightforward and fun to make this great dish. Simply follow the instructions below and get the perfect result. Cook the paccheri in a large pan of boiling, salted water until al dente. Meanwhile, put the Gorgonzola, Taleggio and scamorza in a large saucepan. Add the milk, oil, half the chives and the paprika. Place the pan over a medium to low heat to melt the cheeses and stir to combine. Do not allow the mixture to boil. Remove from the heat and season with a little pepper. When the paccheri is cooked, remove it from the water using a slotted spoon and put it directly into the sauce without draining. Ensure some of the cooking liquid comes along with it. 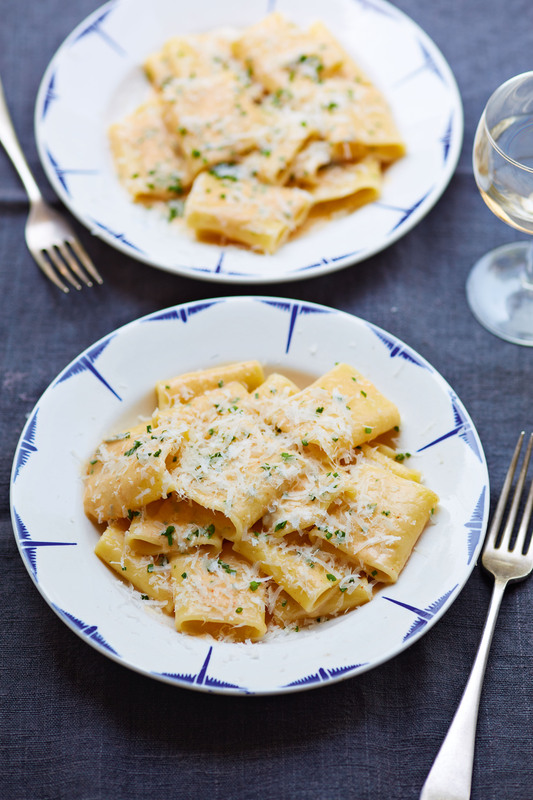 Gently fold the pasta through the sauce and stir in half the pecorino. Transfer the pasta to individual serving plates or bowls. Sprinkle over the remaining pecorino and remaining chives and serve immediately. 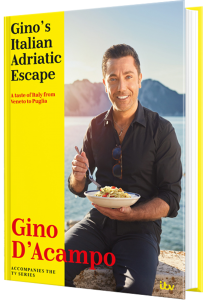 Once you’re done, simply sit back and enjoy your paccheri with four cheeses and don’t forget to check out other great authentic Italian recipes including great antipasti recipes, Italian pasta recipes, Italian soup recipes, Italian beef dishes and authentic pizza recipes.